GF Piping Systems develops, produces and markets a comprehensive range of piping systems and components in a variety of materials used worldwide to transport water, gases and aggressive media. Delivery of the products – whether fittings, valves, measurement and control technology, pipes or jointing technologies – is always fast, flexible and dependable. 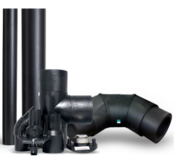 Clear PVC Schedule 40 14"-12"; Schedule 80 1/4"-6"
UPW Pipe: Corzan® CPVC thru 24"
Design-Flow IPS Industrial HDPE ushers in a new generation piping system designed specifically for broad-based applications. The dynamic combination of specifiable pipe, fittings, valves, and advanced fusion technologies integrates well into the industrial process industry. Established in 1958, Harmsco Filtration Products has manufactured innovative and cost-effective solutions for liquid filtration challenges. With 3 divisions and a global footprint our Made In America, Family Owned Business provides energy savings, proven products, and enduring value. 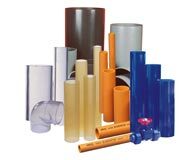 As a pioneer in the filtration industry, Harmsco holds numerous U.S. Patents for innovative filtration technologies while maintaining our focus and commitment on quality and value for the end user. Flowrox is known for its reliable industrial solutions for demanding process conditions. With almost 40 years of experience in elastomer technology, Flowrox is the benchmark for heavy duty valves, pumps and systems.